It is no longer news that the Saudi Arabian people’s voice, Jamal Khashoggi has been missing for quite some time now and he might probably never be seen again as there are reports he was murdered. The well known and connected journalist who hails from a famous family with an ancestry from Turkey and Saudi Arab; has been a mild critic of the Saudi Arabian Royal King, Mohammad bin Salman, and some of the government policies. As a respected and renown Journalist and author, he has served in different capacities to the Saudi government and the royal household, he was reported missing by his Turkish fiancée, Hatice Cengiz, on the 2nd October 2018, after he was captured in a camera, entering into the Saudi embassy in Turkey to process his marriage documents but never came out. Find out more about the missing journalist as well as who his fiance and family members are. Who is Jamal Khashoggi, The Missing Journalist? Jamal was born as Jamal Ahmad Khashoggi in Medina, Saudi Arabia, in 1958. He was raised in his birth country where he attended elementary and secondary schools. He later bagged a degree in Business administration from Indiana State University, U.S in 1982. The Saudi Journalist started out his career in Tihama Bookstores as a regional manager where he worked from 1983 to 1984 before he moved on to work in the English language published Saudi Gazette daily newspaper as a reporter. Jamal rose to become an assistant manager in an Arabic Saudi Arabian daily newspaper known as Okaz beginning from 1985 till 1987. He served as reporter and editor for other various press outfits like; the Al Sharq Al Majalla, Al Muslimoon, and Al Madina, among others from 1987 to the late 90s. Moreso, Jamal Khashoggi has been an international correspondent, he worked for BBC, Al Jazeera, and Dubai TV where he batched out political reports from countries like Sudan, Afganistan, and others in the Middle East. In the course of discharging his duties, Mr. Khashoggi was involved in controversial reports which implicated him as a double agent for both the Saudi Arabian and the United State government at different times especially during the War in Afganistan. His relationship with the late Osama bin Ladin was also questioned at the time. He was an ardent advocate of political reforms and human right as well as freedom of speech and expression for the people of Saudi Arabia. He condemned in clear terms the government’s involvement in the War in Yemen; which further put him on the black book of the Royal family especially the crown prince. Jamal once started an independent news channel which he owned with billionaire Prince Alwaleed bin Talal but that channel was brought down by geeks from Bahrain within 11 hours of its operation. He was seen as a dissent by his country though he had shown massive support for most of the reforms of the crown prince and the Saudi government. Due to this, the Saudi Journalist lived constantly looking over his shoulder. He feared for his life, while he was in Saudi Arabia before he fled to the US on a self-imposed exile in 2017 after he criticized the Crown Prince’s style of leadership. Though not many people (the world over) knew about him while he was relatively free, however, following his disappearance, people from all over the world have been asking questions as it pertains to Jamal Khashoggi’s whereabouts, what played out, how and why. Here is what we know. 1. Jamal was last seen entering the embassy of Saudi Arabia on Tuesday 2nd October 2018 by 1 pm local time in Istanbul, Turkey. His Turkish fiancée, Hatice Cengiz was waiting outside in their car for him. After he had entered there was no other video showing him come out of the building. 2. Fifteen Saudi Arabian agents comprising of hitmen, forensic experts and doctors; 2 of whom were reported to be from the Saudi Royal Bodyguard had landed in Turkey in a private plane. They were captured on camera entering the Saudi embassy on the same day the journalist went in there to obtain his marriage documents but never came out. 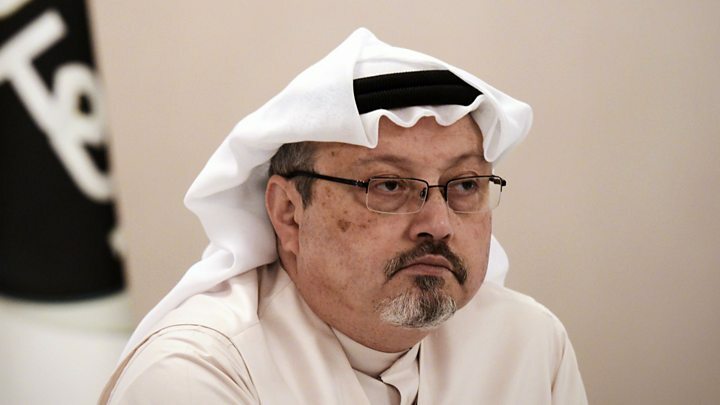 Mr. Khashoggi was later reported missing to the Turkish police after the close of work by 4 pm local time when he did not emerge from the building. 3. The consulate’s CCTV was said to have been down on that 2nd October 2018 which conveniently provides a smokescreen for what went down in the embassy. 4. The Turkish Police believe he was murdered and dismembered then carried out in boxes out of the embassy, though there has been only circumstantial evidence to this effect and not a concrete proof. The authorities also believe that the Saudi embassy tampered with evidence and as well made away with the CCTV video clips of that day. 5. The Turkish authorities claim to have footage of what happened inside the embassy on that bizarre day and they are not alone in that claim as Al-Waqt (a Bahraini Arabic-language daily newspaper) quoted that Saudi Arabian Royal King Mohammad bin Salman ordered a certain Ahmad Asiri to execute Jamal Khashoggi. 6. Many who had in the past voiced their opposition for the crown prince found themselves either in jail or severely dealt with, such as the woman activist, Loujain al-Hathloul, Eman al-Nafjan among others. In addition, the Saudi’s had had diplomatic roars with countries like Canada, Lebanon and now they obviously have another dispute with Turkey over the disappearance of Jamal Khashoggi on Turkish soil. 7. The famous Journalist who has over 2 million followers on his twitter handle has since his disappearance been endeared to many people worried about his whereabouts. How he could just disappear without a trace after entering the Saudi consulate in Turkey as captured by an outdoor CCTV still beats the imagination of the world. All eyes are on Saudi Arabia to explain what happened to the journalist but so far, the Saudi government has only succeeded in giving blanket explanations that have not satisfied the inquiry of all. As the world awaits them to give a concise explanation of how Mr. Jamal Khashoggi disappeared in their embassy, many reports from investigations are pointing that the journalist was killed and dismembered by the suspicious men who called at the consulate. Jamal Khashoggi was a columnist for the Washington Post before his unfortunate disappearance on the 2nd day of October 2018. As a political commentator, he was banned by the Saudi Arabian government, from writing, which eventually led to him going on a self-imposed exile to the United States of America in September 2017 as he feared for his personal safety on the soil of his birth country. Read Also: Jimmy Hoffa Biography And Disappearance: What Happened to Him? The journalist hails from a prestigious family, highly regarded within the circles of the Saudi elites. However, the parents of this renown journalist are not known but Muhammad Khashoggi, his grandparent was said to have worked, as a personal Physician to the King Abdulaziz Al Saud, the founder of the Saudi Kingdom. Jamal’s uncle was the billionaire Adnan Khashoggi, who dealt in the sale of arms and lived lavishly, while his late cousin, Dodi Fayed dated Princess Diana with whom he died in a crash in Paris on the 31st of August 1997. Dodi Fayed’s father Mohamed El-Fayed, owned the Harrod departmental store. The would-be wife of Jamal Khashoggi is Hatice Cengiz, her other names are; Khadija Genghis and she was born on the 6th of April 1980. There are no details about her family as of this moment. She is a Ph.D. Student of the University of Istanbul where she is actively pursuing a doctorate degree, she is 36 years old and resides in Istanbul. Hatice met Jamal in May 2018 at a conference and from then on they corresponded back and forth till their emotional lives grew to the point of making life major decision of being husband and wife- a decision that has not seen the light of the day as Jamal Khashoggi has suddenly gone missen without a trail. She has been beside herself and has reached out to presidents of Turkey and the United State seeking for what exactly happened to her loved one. Hatice Cengiz visited the White House on the 14th of October 2018 on the invitation of President Donald Trump, she extended her appeal to the world to investigate and mete out appropriate punitive measures to the people who are behind the disappearance of her spouse to be.